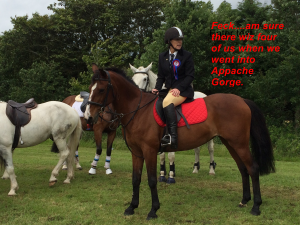 The Presidente took part in the annual Wigtown Riding of the Marches last Saturday and we thought it would be a bit of fun to have a caption competition for this photo of herself and Lucy during the day. Johnjo has send it the first entry – and it’s a cracker. First prize is a ton of that great stuff you can grow rhubarb in.